If you have watched many “beauty gurus” in the YouTube community then you may have heard of the Back to MAC program by MAC Cosmetics. I had seen various videos about this program but I was still not positive about the in’s and out’s so I did a lot of google-ing and youtubing to better understand. Basically the program let’s you bring in 6 old/empty containers from products to recieve ONE lipstick (if you go to the counter) or ONE eyeshadow/lipstick/lipglass (if you go to the MAC store). An example of the items you would back to MAC is lipstick tubes, lipglass tubes, eyeshadow pots, makeup wipe packages and various things. If the item features plastic you can back to MAC it except for eyeliner/lip liner/kohl pencils. After purchasing many items over the year from my MAC counter at Belks & various CCO’s (Cosmetic Company Outlets) I had finally collected 6 items to take back to MAC and I was so excited in doing so. I made such a big event out of it that even my mother and roommate were helping me decide the possible lipstick color I should get. Even though I was gunning for Heroine I did a once over at all of the different choices and surprisingly I did not get Heroine; instead I chose the color Speed Dial which is a creme sheen finish and it is a gorgeous shade of pink. Recently my mother has been on me about my purple lipstick loving and I think that this is another reason why I made the choice that I did. If you are ever looking for a slight change from your usual I think that this is a color you should check out! 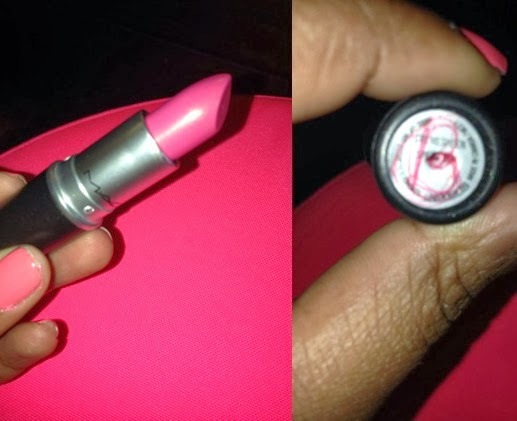 MAC lipstick in Speed Dial (L), Bottom of package is marked with a B to signify it was received in the Back to MAC program. Sadly not for Beyonce! 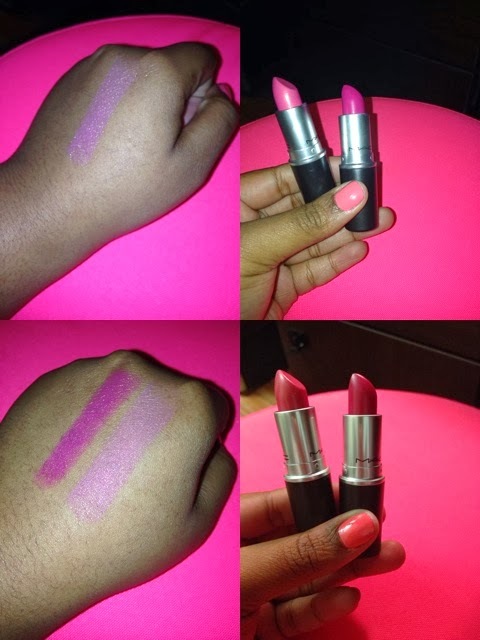 Swatches of Girl About Town and Speed Dial for reference (Bottom Left) and Speed Dial and Girl About Town without flash (Bottom Right). Nothing can go wrong with a free lipstick in my eyes. If you have a few emptied out items please don’t throw them away, save them and you will be able to enjoy the reward! I hope that this post was helpful for you and that you all will considering saving your packages as well.